Tadashi OHMYGOSHI! 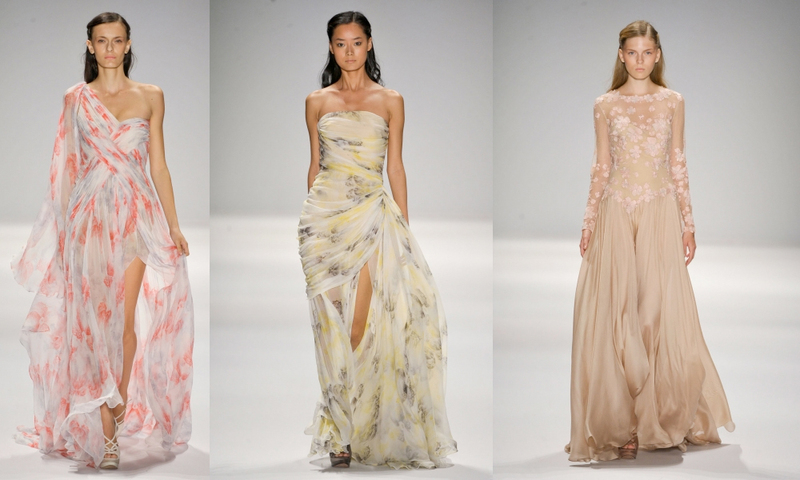 What a way to jump start my fashion week with a collection like Tadashi Shoji. His Spring 2012 debuted on Thursday at Lincoln Center where I had a standing room ticket, but thanks to Pamala and those who don't show up I got a seat rows up from the front. Either way I was able to sit, rock out to some Florence and the Machine and watch some beautiful dresses come down the runway. To say the least, this collection was not lacking in the style department, it really had it all. His show was filled with flowey dresses, bright pinks and yellows, floral prints, stripes, cremes, glitter, ombre and grassy effects. The amazing part was that he had all these different prints and colors that the collection still looked cohesive. I love collections that have reminders of spring and nothing says spring to me like florals and grass. 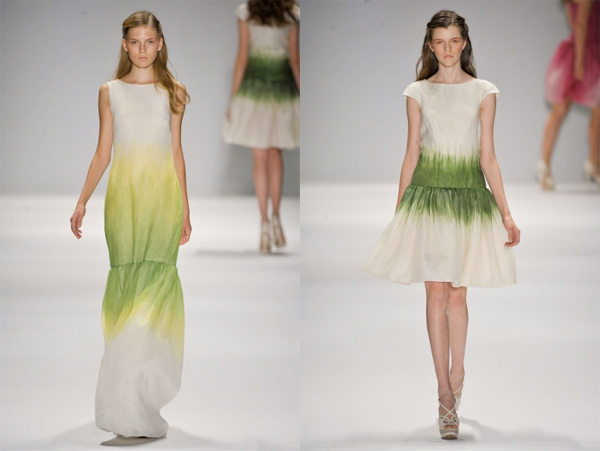 I love how Shoji created a grassy effect on two of his dresses. These dresses looked like he took white fabric, a paint brush, green and yellow paint and started painting straight on the fabric. I also love the mirror image effect on both these dresses. I was truly memorized by his floral dresses, they are just so dreamy. You get lost in the movement and gorgeous soft palate. These dresses are perfect for a spring/summer wedding, even though wearing one of these dresses will definitely get you in trouble with the bride since I'm pretty sure these can out shine her dress. I can also see these beauties being worn to the most sophisticated garden parties. Ombre, stripes, and bright colors! I especially adored the first dress that came down the runway. It was bright pink, had an ombre effect, and looked like a tulip. Yes....a tulip. Forget everything you know about the tulip hem. This dress will make you look like a pretty pink flower with out looking like you threw on a costume. This collection is super feminine and had a lot of different prints, colors, and looks which helps appeal to all woman....of all ages. This has been one of my favorite collections so far that I've seen. I'm a sucker for girly spring dresses and thats exactly what this collection is. If you're a sucker like I am I suggest you going to look at Tadashi Shoji's collection in whole NOW. Loving the long striped dress! Wow! They are lovely! I love the soft colors and the girlie textures. so nice that you went to the show and sat close! lovely pics did you end up going to soho for FNO?? I'd love to see your pics! !